Dallas Private Schools: Our School Gets Results! Once a year, Oak Crest Private School does standardized testing. Like many other schools around the nation, we use the Terra Nova test. An average student would be in the 50th percentile on the exam. This would mean that half of all students taking the test would do worse than this student, and half would do better. This student would be right in the middle of all test takers. Recently, our third to eighth grade average student exam score was in the 93rd percentile. This means that 93 percent of all students who take the test do worse than students at Oak Crest. 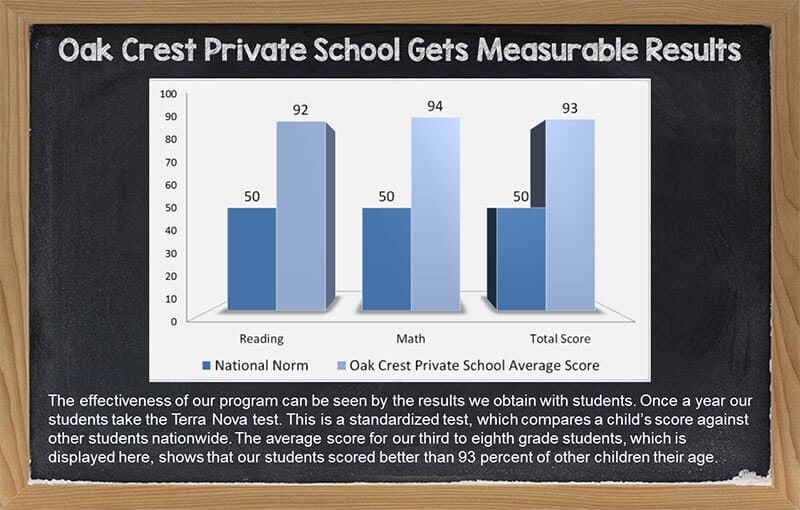 It is not uncommon for Oak Crest students to test a year or more ahead of average students. Oak Crest Private School students are constantly asked to show how they can use their materials. Math is tremendously hands-on. Science courses go from one experiment to the next, so that students can actually see the principles being taught in operation. Reading about history is brought to life by field trips to see what life in the past was like. Not only does this approach maintain and even increase a student’s interest in his courses, but it results in children who can confidently go out and use what they have learned. Isn’t the ability to do that the reason we all wanted to learn in the first place?